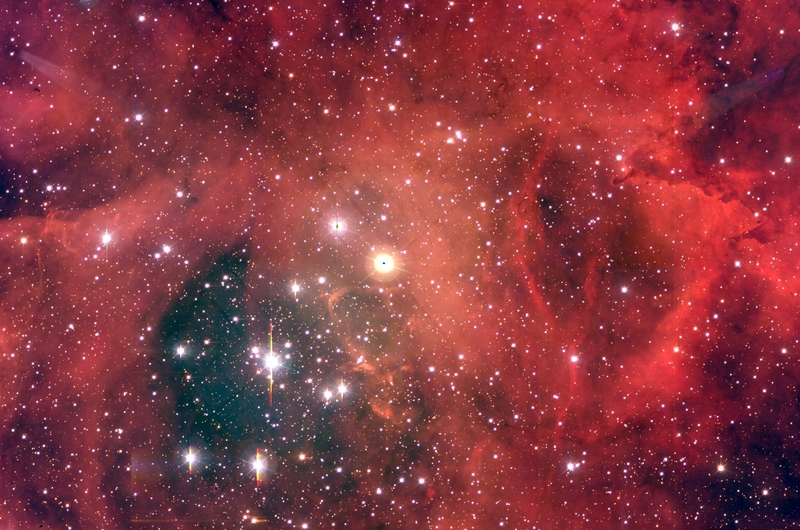 Explanation: In the heart of the Rosette Nebula lies a bright open cluster of stars that lights up the nebula. The stars of NGC 2244 formed from the surrounding gas only four million years ago and emit light and wind that define the nebula's appearance today. High energy light from the bright young stars of NGC 2244 ionizes the surrounding hydrogen gas clouds to create the red emission nebula appearance. The hot wind of particles that streams away from the cluster stars contributes to an already complex menagerie of gas and dust filaments while slowly evacuating the cluster center. NGC 2244 measures about 50 light-years across, lies about 4500 light-years away, and is visible with binoculars towards the constellation of Monoceros.